Spinning was another task that the industrial revolution took, for the most part, out of the home and into the factory. However, even more than weaving, there was still home spinning going on during the years leading up to the civil war and then more in the South during the blockade. In the combined book and CD Historic Accounts listed in the Modern Books section, in the Adkisson store ledger there are numerous instances during the period 1859 through 1861 when customers to the store purchased both wool and cotton cards, tools for combing wool before spinning. In The Blockaded Family, listed in the Facsimile 19th Century Books section, Parthenia Hague describes her efforts to spin. 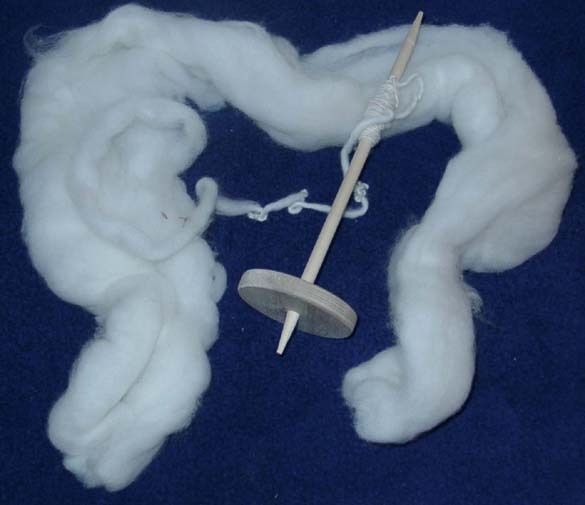 As far as we can determine, the use of a drop spindle (also called a "rock" in Alice Morse Earle's Child Life in Colonial Days) as a tool for producing spun fibers was replaced by a spinning wheel by the time of the civil war. However, to obtain a spinning wheel for demonstration of spinning is an expensive purchase. 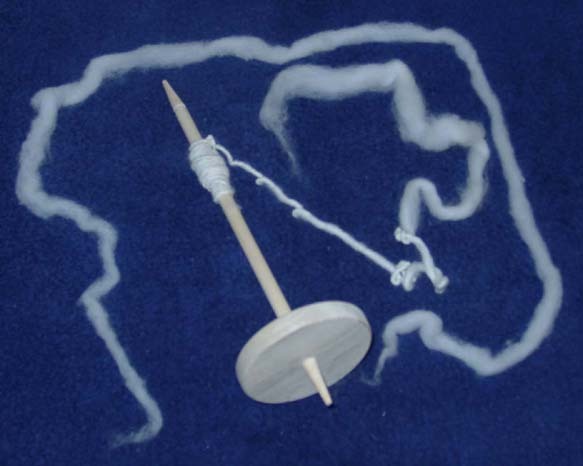 The use of a drop spindle is an affordable way to demonstrate spinning and even provide spectators with the chance to try it themselves. The demonstrator, however, should make a point of telling the spectators that use of such a tool was probably rare, if at all, during the civil war period and that the spindles are only used for demonstration purposes. The drop spindle comes with the spindle itself and a bunch of combed wool. A narrow strip of wool can be peeled off the large bunch, and this thin strip used for spinning. When the spinner reaches the end of the strip, another strip can be overlapped by a few inches and the two ends spun together. If the supply of wool is exhausted, carded wool can be purchased by visiting the web site for Old Sturbridge Village and go to the gift shop. Look under craft and fabric/craft kits and go to the end of the "kits."